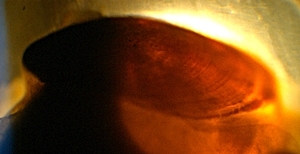 nal shell (Length: 5 mm). Pictures: Parent Géry (Source). The Ancient Greeks already named the sea hares because of their large elongated rhinophores resembling rabbits' ears. The rather corpulent looking sea slugs have a thin internal shell from protein hidden by the mantle. The Californian black sea hare (Aplysia vaccaria) leaving on the American west coast can grow up to 75 cm length and weigh more than 2 kg. 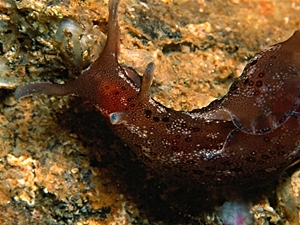 Assumedly, Aplysia vaccaria is the largest present-day gastropod species. Compared to it, the dwarf sea hare (Aplysia parvula) with a size of up to 6 cm does look like a dwarf. The Aplysiomorpha group, like it is called with its current scientific name, also is referred to as broad-foot snails (in German). This is because of those snails' parapodia, used to laterally stabilize the animal, when it is crawling on the ground, making for an especially broad foot. 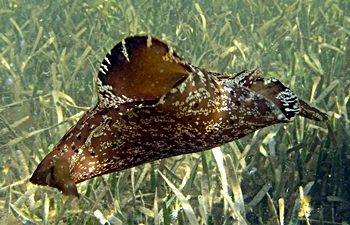 There are swimming species, too, such as the spotted sea hare, Aplysia brasiliana, using its parapodia to swim with undulating movements, like a cuttlefish does. Spotted sea hare (Aplysia dactylomela) near Malta. Sea hares are exclusively herbivores feeding on algae, wrack or sea grass. While the sea hare eats plant parts using its radula (like a terrestrial snail does) it also eats the algae growing on the actual plant. Those can be of different use to the sea hare: So some species can spill a purple coloured cloud of ink, if they are disturbed. It has been found out that a sea hare's ink consists of different organic compounds. Besides, the sea hare mixes it with a milky secretion called opaline, secreted by a separate gland. Interestingly enough, a sea hare's ink alone has no deterrent effect. 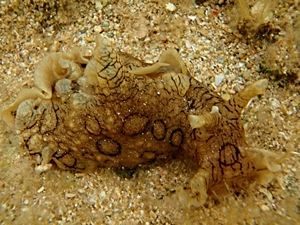 It only contains an enzyme called escapine, an antimicrobic agent suppressing infections, should the sea hare be hurt. Only when it is mixed with the opaline secretion rich in lysine, escapine also produces deterrent agents, busying the predator so the sea hare has time to escape. Opalin has a strong content of taurine and has the predator assume an imaginary food source (Phagomimicry). P. Z. Myers: Lobster vs. Sea Hare. Johnson, P. M.; Kicklighter, C. E.; Schmidt, M.; Kamio, M.; Yang, H.; Elkin, D.; Michel, W. C.; Tai, P. C.; Derby, C. D. (2006): Packaging of chemicals in the defensive secretory glands of the sea hare Aplysia californica. Journal of Experimental Biology 209, 78-88 (Link). Another agent, effectively deterring predators, is the so-called aplysiovioline, found in the American species Aplysia californica. ming to the left. Picture: Sean Nash (Source). In the meantime, it has become known, that this deterrent is produced from phycoerythrobiline the sea hare gains from red algae on its food. The basically harmless red alga pigment is altered chemically in the sea hare's ink gland - a most astonishing evolutionary feat. Glen Brizius: Sea Slugs Utilize Chemical Weapons: Novel Protection from Predators. Kamio, M.; Nguyen, L.; Yaldiz, S.; Derby, C. (2010): How to Produce a Chemical Defense: Structural Elucidation and Anatomical Distribution of Aplysioviolin and Phycoerythrobilin in the Sea Hare Aplysia californica. Chemistry & Biodiversity, 7: 1183 - 1197 (PDF). Other sea hares are able to protect themselves with a poison. Aplysiatoxin is gained from blue algae (Cyanobacteria, for example Lyngbya majuscula, Schizothrix and Planktotrix), the snail has taken in with its food. Even more effective poisons are found in other opisthobranch snails, such as the side-gill slugs ('Notaspidea'), which may contain tetrodoxin (also the venom of puffer fish and blue ringed octopuses). Habermehl, G. H.: "Gift - Tiere und ihre Waffen"; Springer Verlag, Berlin; 5. Ed. ; S. 24 f.
Bill Rudman: Ink Glands (of Sea Hares) on seaslugforum.net. Johnson, P. M.; Willows, A. O. D. (1999): "Defense in Sea Hares (Gastropoda, Opisthobranchia, Anaspidea): multiple layers of protection from egg to adult". Marine & Freshwater Behaviour & Physiology, 32: 147-180. Sea hares as well develop passing a planktontic larval stage, while most adult sea hares have a benthic way of life on the ocean floor. see: The Aplysia language of love. Short movie about the spotted sea hare (Aplysia dactylomela). Source: Instituto Nacional de Biodiversidad, Costa Rica on YouTube. The other snail is an umbrella shell (Umbraculum). In dense populations, sea hares mate in chains, in which the rear animal functions exclusively as a male, the animals in between as males and females at the same time, and the first sea hare functions only as a female. The communication in that matter takes place by pheromones transmitted by sea hares ready to mate. They are most likely as little species specific as the mating pheromones in Roman snails (see also Courtship pheromones of the Roman snail), because sea hares of other species are attracted as well. Interestingly, sea hares of different geographical locations have different pheromones in the same species. Bill Rudman: Mating Chains (of Sea Hares) on seaslugforum.net. Scott Cummins: The Aplysia language of love on seaslugforum.net. Bill Rudman: Sea Hare 'love drug' on seaslugforum.net. Systematically, sea hares until some time ago were called Anaspidea. Literally the "shield-less snails", with this scientific name they were opposed to the Cephalaspidea, the head-shield snails. As this term, comparable to the term 'Pteropoda' for sea butterflies and sea angels, does not refer to any special genus, in modern systematics today the clade name Aplysiomorpha is used. 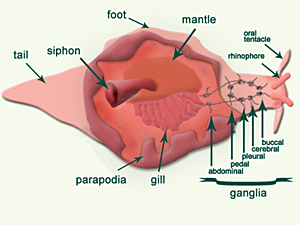 Anatomy of Aplysia californica (Source). Additional fame sea hares received by the research done on the gill withdrawal reflex, the neurobiological bases of which were researched by the Austrian born American Nobel Prize laureate Eric Kandel. Sea hares have very large neurons and very few of them, about 20000, which can be examined and measured very easily. 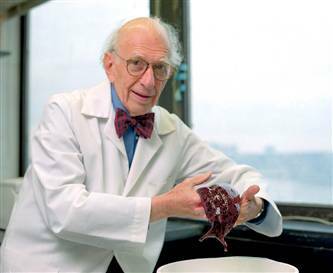 Prof. Eric Kandel with a sea hare (Source). When a sea hare is touched at its mantle opening (the sipho), the gill is withdrawn as a reflex. If this impulse is repeated, after some time the gill withdrawal time decreases, a reaction called habituation. Another matter is, if the tactile impulse is accompanied by a pain impulse, say, an electrical stroke at the tail tip. Then the reflex reaction increases in strength with time, a reaction called sensitivation. The enhancement of the gill withdrawal reflex happens by intermittent neurons, connected with both foot neuron and mantle neuron. Caused by the pain impulse, the intermittent neuron produces the messenger serotonine. This causes the mantle neuron to produce more of its own messenger compounds and consequently the reaction to increase. The third learning behaviour researched on sea hares is classic conditioning. After several applications of both pain and tactile impulses the pain impulse does not have to be applied anymore, as the sea hare has learned mantle touching to be connected to pain, resulting in a very strong reaction. Additionally by an enzymatic reaction in the neural cell core, the building of new synaptic connections is excited (to that end, special genes are "switched on"). Similar tests are currently done with sea hares exposing them to near-lethal attacks by head-shield slugs (Navanax). At first, the sea hare reacts only very little, but it learns to live with the danger and will react much faster and more strongly to further attacks by the slug. Fourth, operant conditioning has also been tested in Aplysia. A biting behaviour of the sea hare was awarded by an electrical stimulation of the oesophagus, telling the sea hare it was being fed. As a consequence, sea hares showed much more often a biting behaviour, even though they had never actually been fed. NOVA Science Now - A Memorable Snail. Björn Brembs: Operant conditioning of biting behavior in Aplysia.